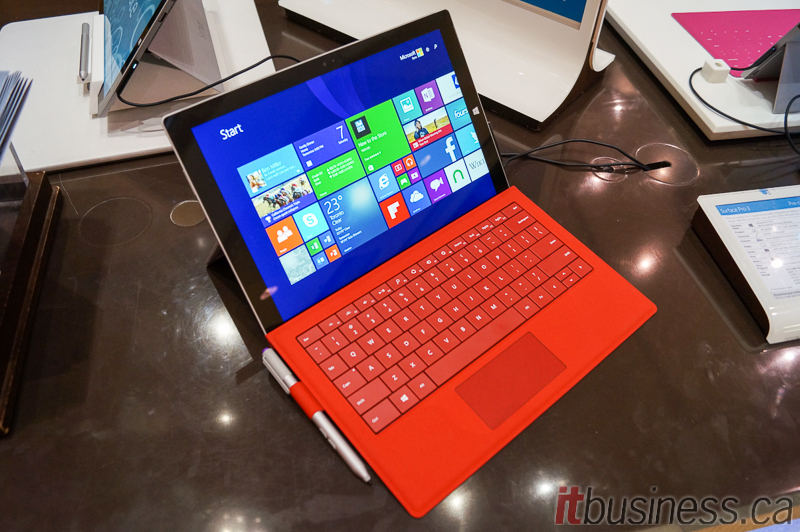 Unlike the other machines on this list, the new Microsoft Surface Pro 3 is a convertible tablet. So while it is not an Ultrabook, we did want to include it because Microsoft is promoting it as a tablet that can replace your notebook when you add a keyboard to it. While Microsoft was saying the same thing about the smaller Surface Pro 2, we think with the Pro 3 Microsoft finally has a device that is up to this task. Also, it does come with Windows 8.1 Professional, so Microsoft is clearly aiming this at business users, rather than consumers. 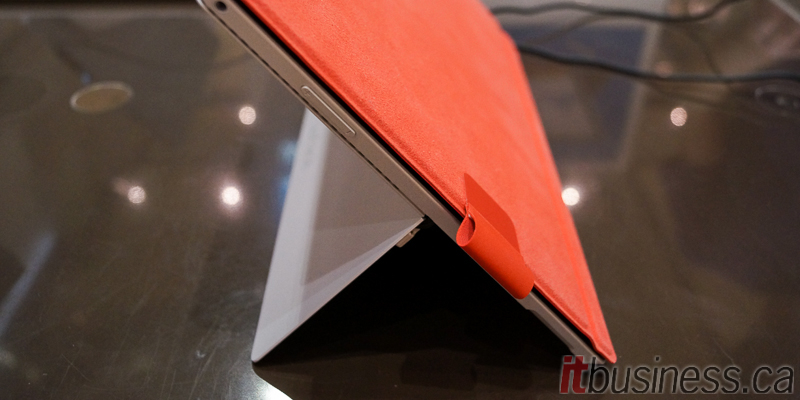 Since it is also a tablet, the Surface Pro 3 is very thin and very light. Even with the keyboard cover attached it is 1.4 cm, making it the thinnest machine in this list. It is extremely well made from magnesium-alloy, and has a very high level of fit and finish. It is also very attractive – its crisp, clean lines are finished in matte silver that resists fingerprints. However, despite its premium construction and materials, it is not going to be as durable as some of the other Ultrabooks on this list that has passed various MIL-SPEC tests. 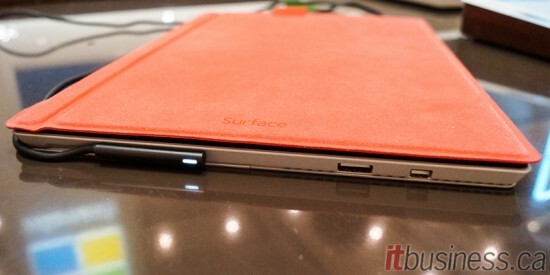 For it to function as an Ultrabook, there are two important components. The kickstand on the back of the Surface props up the tablet on a table or your lap, and the keyboard cover that attaches magnetically to the bottom. The Pro 3 has improved these two components considerably over its predecessor. Firstly, the kickstand now has a full range of motion (the Surface 2 Pro’s stand only has three positions), so the screen can be set at any angle, as it can be on traditional notebooks. Secondly, the keyboard cover now has a secondary magnetic attachment point that helps keep the Surface Pro 3 steadier when using it as an Ultrabook and improves the typing experience. That being said, despite all these improvements, the Pro 3 is still not as flexible and comfortable to use ‘proper’ notebook in every situation. You need enough room for both the keyboard and the kickstand to have some support – a regular notebook just needs support under the keyboard in order to be able to use it. The Surface Pro 3 has a gorgeous super high-resolution IPS screen that Microsoft is calling Full HD Plus (2160 x 1440). It has an unusual 3:2 aspect ratio, making it a little squarer than the 16:9 screens found on most Ultrabooks. This aspect ratio makes the screen wider when using the Pro 3 as a tablet in portrait mode. One problem such a high-resolution screen has when using Windows is that some legacy (desktop) apps may have trouble scaling to the very high DPI of the Pro 3’s screen. The Pro 3’s ‘Type Cover’ keyboard is naturally bigger than the Pro 2’s because the tablet itself is bigger. This larger size means that the Pro 3 has a much better typing experience because the keys are bigger, and the cover has less flex. Unfortunately, while it is a better keyboard that the ones found on older Surfaces’, and even some of the 3rd party keyboards for other tablets like the iPad, it is still no real substitute for ‘real’ keyboards like the one on the T440s. The cover still flexes when you type, and the key travel is very shallow, making for a ‘springy’ typing experience that can hinder speed and accuracy. Similarly, while the touchpad is vastly improved from the one on the previous generation Type Covers, being a bigger and being a real clickpad, it cannot compare to the touchpads of the other Ultrabooks on this list. It is simply too small. The Surface Pro 3 is the only Ultrabook here that has Pen input support. It uses N-trig’s technology, so the pen has a battery inside, and is a little thicker and heavier than the Wacom pen that came with the Surface Pro 2. The pen works well for both creative work in Photoshop and other graphic design programs, and for handwritten note taking with applications like One Note. There is even a button on the top of the pen that opens OneNote when you click it, so you can take a new Note, even if the Surface’s screen is off. Part of the reason the feel of the pen is so good is that the gap between the Surface’s glass and LCD is incredibly thin, so it looks like you are putting actual pen to paper when working with the stylus. Disappointingly, like the Surface Pro 2, there is no slot for the Pen. In fact, this time round the pen does not even attach magnetically to the Surface – there is a fairly flimsy looking loop that attaches to the keyboard that holds the pen. This set up doesn’t look very practical, and we would have much rather had Microsoft add a little more girth to the Surface so the pen could be stored internally – if you end up losing it, it costs $50 to replace. Along with the MacBook Air and HP EliteBook 1040 G1, the Core-i7 Surface Pro 3 models come with Intel with HD 5000 graphics, a big step up in performance from the HD 4400 graphics found in the i5 model. We have not been able to test an i7 model out though since they are not shipping until the end of the summer. The i7 model can also be configured with a 512 GB SSD drive, and like the graphics story, the Pro 3 is one of the few models here that can come with such a large amount of storage out of the box. Due to its dimensions, it is understandable that the Pro 3 wouldn’t have much in the way of ports – it only has one USB 3.0, a mini DisplayPort out and a microSD card reader. We would have liked to see Microsoft try and squeeze in at least one more USB 3.0 port. It does, surprisingly, have full docking station compatibility. The Surface Pro 3 slides into its dock vertically, since there is no way to connect to the keyboard, and it also needs to be to dock when it is acting as just a tablet. The $200 Surface Pro 3 Docking Station adds three USB 3.0 ports, two USB 2.0 ports, Ethernet and mini DisplayPort. Like many of the Ultrabooks in this list, there are no user upgradeable parts, but with the Surface there isn’t even an option to unscrew and disassemble the chassis if you are confident enough – it is completely sealed. The Surface Pro 3’s non-removable battery has been tested to run for 7.5 hours, which is good, but not great, for an Ultrabook (but not so good when compared to other tablets). One of the biggest complaints we have about the Surface 3 Pro is that the Type Cover is not included with it or in the price. If Microsoft if pushing the Pro 3 as an Ultrabook competitor, then they should include a keyboard, at least in one SKU for a reduced price (the pricing shown below includes the separate cost of the keyboard cover). That way users Microsoft can potentially sell the Surface to more customers if they are OK with, say, a black or blue keyboard cover, and then sell the two separately for those who want to be able to pick a different keyboard cover. The Core-i7 Pro 3 models when you include the price of the keyboard cover are very expensive, especially when you consider the limitations of the Pro 3 compared to other top-end business Ultrabooks. In spite of that, the lower end Core-i5 models ARE comparable in price to equivalently spec’d Ultrabooks. So, the big question is can the Surface Pro 3 be an Ultrabook replacement since it is still, after all, simply a Windows tablet with a keyboard attachment. The answer would depend on how you work since while it does work well as a notebook, there are other machines in this list that are better Ultrabooks. However, none of them are also tablets, and none of them have pen input, so if those are features you think you will find yourself using a lot, then, yes, the Surface Pro 3 is a good business Ultrabook choice.